Development of DNA mark-recapture methods for grizzly bear populations in British Columbia and Alberta. Since 1997, IER has collaborated with government and university researchers to develop DNA mark-recapture methods to establish previously unprecedented population estimates for grizzly bears in British Columbia, Alberta, and the United States. In addition, we innovated the first study of trend monitoring in grizzly bear populations using DNA methods and are currently developing new techniques to use multiple data sources to examine population trends. Recently, we have been applying spatially explicit mark-recapture methods to optimize study design and better understand factors affecting distributions of grizzly bears on sampling grids. Research of barren ground caribou in the Nunavut and Northwest Territories. 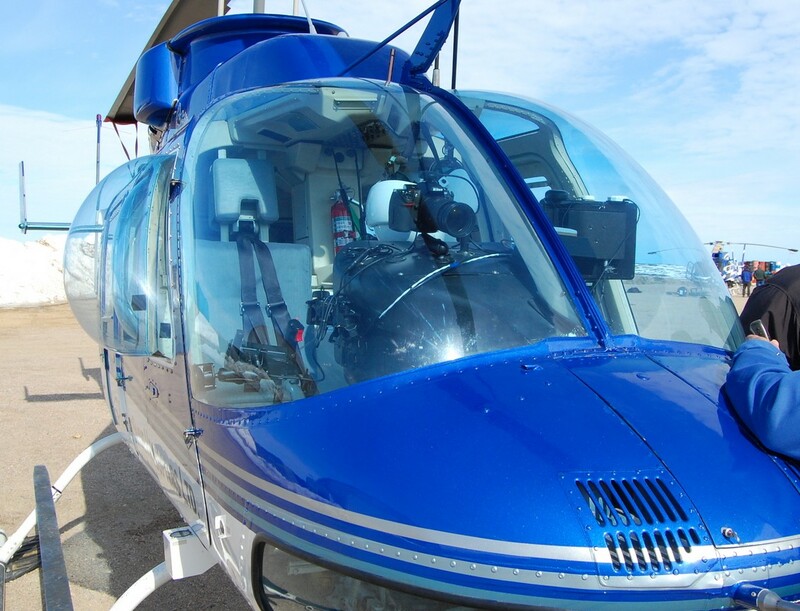 This work involved design of population and demographic estimation field studies, data-driven population viability analyses, methods to estimate the influence of mines on caribou distribution and development of double observer methods to refine visual survey estimates. 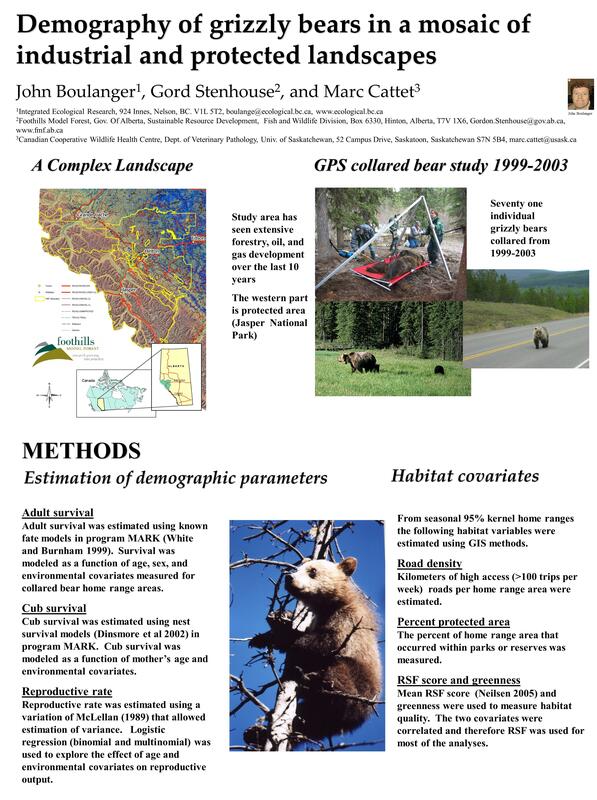 Analysis of demographic data and remote sensing data to determine factors affecting grizzly bears in Alberta. 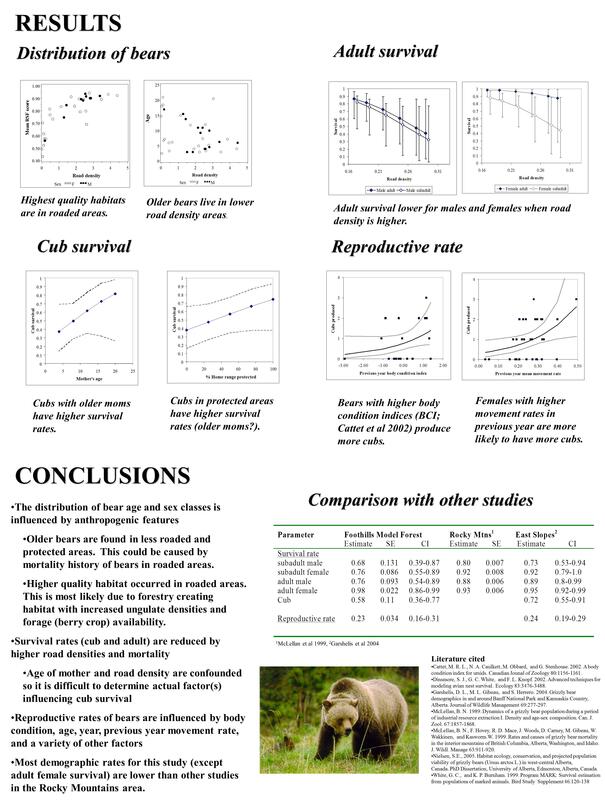 Collar data and remote sensing data was used to assess factors influencing bear demography in the foothills of Alberta. A poster on this project is shown below. Two peer-reviewed journal publications were also produced from this research.